Part 2 The Continental Range. The Waddingtons/Hasbro Additions (C201-61221), (61222-61240 + reused numbers). First introduced in 1961, the Continental range was where Subbuteo really started to develop its distinctive look. Once the players had been changed to the standard OO scale of model railways and military miniatures the way was open for all sorts of peripheral items which would make the tabletop look more like a real football league game. This list is again in numerical order. When I was scanning pictures of goals, balls, goalkeepers, etc. I thought it might be easier to put all the similar accessories together, but this did create too many problems and in the end I decided against it. If you think this is an easier way to find what your looking for, then I can again recommend Jon Shelley's site, where he's done just that i.e. a page full of goals, a page of trophies... you get the idea. There are a lot of illustrations on the following pages, so please be patient with them. Spring 2010: I have added so many new pictures to the accessory range that I have had to split it at C110. C100: Complete team of OO Scale dimensional figures. Obviously the teams were the whole reason for the "Continental Range", and as you may have noticed, they are discussed at length elsewhere on this website. See the boxes appendix for details of the various C100 boxes. Set 1: Two pylons. Set 2: One pylon. Just a thought, but wouldn't it have been less confusing to have Set one as one pylon, and set two as two? Subbuteo Sport Games eventually figured this out, and the different versions became set A, and Set B in the 1970s. In the range tidy of the late 1970s the single pylon was taken off this number, and became C171. The reason for the two options, was one of cost. Floodlights were an expensive luxury when they were introduced. Both sets were actually sold in the same box. Only the card inserts were different. 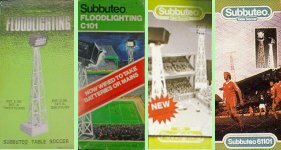 Despite some powerful powerful batteries, Subbuteo floodlights of all types are notorious for only giving out a faint glimmer of light. When I was a kid, I couldn't afford floodlights, but instead used an Action Man searchlight. This was a similar size and ran off the same chunky flat battery (now sadly unavailable). The Action Man searchlight did have the power of a torch, and if I had owned four of them, I could've had a decent floodlit game. So this should not have been beyond Subbuteo's designers. Although the floodlights boxes often advertised "new" features, there were basically two distinct types of floodlight sold under this reference. 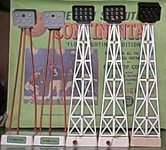 The original floodlighting set was the first Continental accessory produced, and the first ever OO scale boxed set was a Floodlighting Edition. Arriving in 1961, these early floodlights were supported by three thin, hollow red poles, which were identical to those in the contemporary red fence (C108). Each floodlight had a flat white base, with a green Subbuteo sticker on the front. This base was designed to house a big, flat bicycle lamp battery. At the top of the poles was the light box. This was silver, with a pearl front, moulded to suggest six lights. One of the six lights was a hole, and behind this sat one small 3.5 volt bulb. Connected to the bulb holder were two wires, which you could feed down the poles to the battery box. It was that basic. Even now, if you place a battery between the wires, you can often get a weak light. Often the straws don't want to fit into the base, and the lights end up looking wonky. Sometime towards the end of the run of red floodlights, the front of the battery box changed to a more realistic black "lens" with twelve clear plastic circles. The new fronts were bigger, and more like an extension to the light box. Sadly, they did not fit very well, and and have a tendency to fall out. Box types:- The original floodlighting box, like the original C100 team box, was white in colour. This featured the same picture used on the Continental box sets of the 1960s, and floodlights can clearly be seen in the illustration. As with C101, the all white box was soon replaced by a version with a green panel on the lid. White Girders Black light box Black lens 4-3-4 formation. Battery box with contacts and switch. (1980/81 - 1991) Various battery boxes in both white and beige with different sockets and contacts around this period. Box types:- The white floodlights arrived in a typical early 1970s illustrated box, which featured a a slide out tray. The falcon-crest box advertised the new "mains adaptable" nature of the lights, and also saw the arrival of a polystyrene inner for the box. This inner was also used in the boxed editions of the time. This box arrived in 1979, when the single floodlight was dropped from this reference, and the mains adaptor introduced. The "box" is actually just a thin card wrap, but it has a nice colour illustration. The monochrome-logo box fitted nicely to the accessory range of the time, but the black and white illustration was a backward step with the bigger accessories. The green-logo, and red-logo boxes featured an action photograph (Nottm. Forest), and a lift-off lid. There is no bottom to the box though, the lid fitted straight over the polystyrene. The photo of my own floodlights at the top of this article illustrates type one, three and five (with beige battery box and switch). If you have the 1990 style greek pillar style floodlights, theses were given a new number 61222. A simple pack of replacement goalkeepers for when you had sat on the originals. Playing on the floor, this would happen a lot (and Subbuteo collectors know how many teams have re-glued/broken goalkeepers in them). This accessory lasted from the early days of Continental equipment right through to the late 1990s, and understandably they went through quite a few incarnations. The original 1960s goalkeepers were fitted into the standard one-piece flat base of the earlier flat celluloid/card teams. As with those sides, a wire rod slotted into the base, but the Continental rods were a new design, being much longer, with a more comfortable handle. These rods could vary in length as the illustration above shows, but all of them were considerably longer than the green plastic rods that came later. This meant that if you played a kid who owned an early set, he could sweep the whole penalty area clear of ball and attacking players whilst "making a save". The original diving goalkeeper figure had an action pose, with a good impression of movement. He was a bit skinny compared with the later keepers, and perhaps lacked a little detail. He also had a small head, and no neck. I've actually found a second diving goalkeeper from this era, who seems to be rarer. Shown in the green shirt above, he is recognised by the horizontal creases on his shirt (especially on the back). I am guessing, but he looks related to the chunky style playing figures that were later used in the rugby game. The familiar "diving back" heavyweight goalkeepers arrived late in the metal rod era, and do appear with short-sleeved teams. Pack types: I had never seen boxes for this era of goalkeeper, and assumed that they were simply sold in bags. However, Ashley Hemming has sent pictures of boxes for both these 'keepers, and the crouching version (C105). The bagged versions in the 1960s were supplied with a simple paper identification sheet, with green text. These were produced for many of the accessories of the era. As Subbuteo was mainly a mail-order business in the early 1960s, it is possible that the "posh" boxes were supplied to shops, but items ordered direct from Peter Adolph were sent bagged. Goalkeeper colours - Generally, the early keepers have coloured jerseys, white shorts, and white socks with a painted top contrasted with the jersey. This was usually green jersey with red sock tops (or visa-versa), or blue jersey with yellow sock tops (or visa-versa). The later goalkeepers have fully painted socks that match the jersey colour. The diving back version definitely arrived in the wire goalkeeper era (and is also illustrated there), but I think the straight 'keeper was a later improvement. The leaning back ones is certainly more common in early sets, but all the catalogues up to 1979 show both (with more of the leaning back ones). When the team boxes changed to having plastic inserts in the mid-1970s these originally had space for both types of goalkeeper, but the final versions of this lift-off lid box only had room for the straight backed goalkeeper. The "single window" box that appeared in 1978 also had no room for the leaning 'keeper. However, by that time, Subbuteo had changed the keeper once more. At the end of the 1970's the outfield players were redesigned as Subbuteo teams switched from hand painted to machine painted. These teams were accompanied by a new goalkeeper type, which became the standard. The first appearance in a catalogue for this goalkeeper was 1980, but they seem to have arrived earlier than that. Interestingly, this new goalkeeper was not initially machine printed. This keeper started on a slot base, and did not move to a round peg until the mid 1980s. The first English catalogue to show the peg is 1986 (and the live-action keepers C123 lasted on a bar for longer than that). The final Hasbro keeper was still this basic design, but the final version was slightly slimmer with a less detailed casting. This made him look more fragile than a goalkeeper should be. I've scanned two versions of the peg goalkeeper as a comparison, but they don't look a great deal different in the picture. The older one is on the left. Box types:- The green rod 'keepers start in a plain early 1970s box, identical to the one shown under C105, but with C102 on the end flap. There was a nice illustrated box for the hobby-crest era (circa 1978-80), and a similar box in the mono-logo era (1981-83). 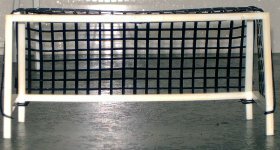 The 'keepers were placed in a bubble-pack in the mid-1980s (goal net backing card), before returning to a box in the 1990s. The 1970s-80s boxes should have an insert to support the goalkeepers, but the 1990s boxes don't have this type of luxury! Goalkeeper colours - The lightweight goalkeepers usually have black shorts, but a variety of jersey colours have been seen - yellow, green, blue, red, and grey are the most common. Goalkeeper colours - Somewhere in the bubble-packed mid-1980s, the goalkeepers in C102 changed to a unique design, where the colour of the shorts was painted to halfway up the jersey (as shown on the 1990s box). Again, colours can vary. Other goalkeeping "C" numbers are C105. C106, C123, C133, C153, C201, C202 and C203. Available in red, yellow, dark blue or light blue. This is another accessory that closely followed the introduction of the OO scale teams, arriving in 1962. The 1960s catalogues offered the set in a choice of light blue or dark blue. These were joined in 1970 by red and yellow versions. In the early sets the colours were painted onto white plastic, but in the later 1960s sets, and throughout the 1970s, all four kits were moulded in the relevant coloured plastic, so only hair and flesh needed to added by the painters. The 1971-72 catalogue stated that the two blue versions were available "whilst stocks last", but stocks did manage to last right through to the final catalogue appearance in 1977, although it is possible that they changed their mind. If you can make out the style of the tracksuit in the pictures, you can see how out of date they were getting in the 1970s. Box Types:- This set was originally produced in a flat square box, with pitch detail interior. This box was not a great idea as it was thin and flimsy. There was hardly room for the bases in the insert, so the players tended to roll around in the box. Sensibly, they were soon put into a version of the standard team box. This had the advantage of being able to use the same inserts as the team (with the eleventh player taking up the goalkeeper position). The box was updated in the 1970s style, and they lasted just long enough to get a "Chiddingstone Causeway" addressed version of this final box. C104: Photographers, trainer and manager. ...add big-game realism when placed behind the goals and on the touchline. As you can see, two versions were produced. The first set was produced from 1962 until the mid 1970s. These were bar and groove figures, like heavyweight players, and were available on a thick plain base or a thinner base with a logo. The cameramen in this set are holding huge box cameras with impressive flash guns, and the manager looks more like a bank manager, with trilby hat and a suitcase. The trainer wears a cloth cap and a baggy jumper, which was normally painted in light blue. Charles Stadden invoiced for work on this set in September 1962. The newer version lasted until 1986 on this number, after which it combined with the ball boys and police to become 61214. That continued until 1996 when it combined sets again to become 61239. It also appeared in C187/2 from 1981 to 1983. Pack types:- Two boxes were produced for the set, both matched nicely to their respective era. The 1960s box had the usual pale green top, on a white lift off lid. The figures were displayed inside on a plain green insert. The 1960s figures carried forward into the 1970s box, which was a one piece box with open ends (shown at the top of the page). The insert was still included, and simply slid out the box. When the new figures arrived in the late 1970s, they initially used the same box, but with a new darker insert (needed to fit the smaller bases). In the hobby-crest re-box of the late 1970s the figures were placed onto bubble-packs, and here they remained until amalgamated into 61214. As that happened in 1986, all three backing cards would have been used. The1984-86 version is shown here. The cameramen in the early set are a selection of drab greys and browns. Luckily, although the trainer was usually in light blue, this is not always the case, as these scans show. The claret wearing trainer does seem to be lurking at the back of the 1975-76 catalogue (shown at the top of this entry). There is a distinct lack of variation in the later version of this set despite about twenty years of production. Basically, the greys, browns and blacks on trousers, shoes or hats are interchangeable, and the best you can hope for is matching or contrasting grey or brown jackets and trousers on the standing photographers. Yawn. A simple set that arrived in 1963, this gave you the choice of having a tiny goalkeeper with no reach. Not a very useful set then, but the upright pose might bounce the ball back out into play, whereas the leaning back diving goalkeepers seemed to bounce it into the net... These goalkeepers were the norm in box sets of the 1960s and early 1970s, where they sat nicely in the box (unlike the diving ones). They also appeared in 1960s teams, but were not as common there as the diving version. Once we reach the green rod 'keepers of the 1970s, the crouching goalkeepers slowly disappear from the team sets, and the team boxes with plastic inserts that arrived in 1977 made no allowance for them. They were absent from the 1978 catalogue where their place in the range was taken by the much more practical diving goalkeepers with caps (C153). Their place in the set of interchangeable goalies (C133) was also taken by the capped goalies at this time. However, my original box set from 1979 did feature a pair (one in all white, one in a green jersey). Perhaps this was how SSG finished up the stock. Box types:- As with C102, the metal rod keepers were usually sold bagged, but a box does exist. Both versions are now illustrated. The plastic handled goalkeepers were sold in the usual goalkeeper boxes of the early 1970s, the only difference between the sets being the reference numbers on the end flaps. Again, these boxes had card inserts to protect the 'keepers. Thanks to Ashley Hemming for the photo of the metal keepers box. 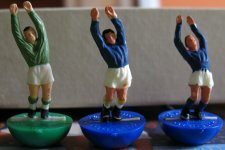 Two goalkeepers without rods, or in reality, two normal outfield figures painted in colours which hopefully made them look like goalkeepers (i.e. black shorts!). This set was useful for goal kicks, and manic "Bruce Grobblelaar" style rushes out the box. Normally, I just used whatever spare outfield players I had hanging around, and so the set was not crucial. C106 was downgraded to "request only" on the 1983 price list, and did not appear on the 1985 poster. Later cash-ins on the same theme were C202 and C203 from the early 1980s, although they were not as stable as using a proper playing figure. The pictures now illustrate various spare goalkeepers through the ages. The original heavyweights shown left, are painted to match the 'keepers on rods from that era, with sock hoops that contrast with their shirts. This paint design carried onto the classic heavyweight (shown middle) and a common early version of this set was green shirt with red sock trim, and red shirt with green sock trim. In the 1970s, diving goalkeepers were usually painted with socks to match their shirts. The spare goalkeepers changed to represent this, although they were usually painted with black shorts, which was more uncommon on the "rodded" keepers at that time. For the lightweight era (shown right) the spare goalkeepers kept to this formula, and as black shorts had also become the norm for the diving keepers at this time, these were well matched. On the above picture, the red goalkeeper is hand-painted whereas the other two are machine printed. The green shirted goalkeeper is in a 1990s base (small letters) suggesting that the set was still sold beyond its final catalogue date. Blue shirts in machine-print and hand-paint were also produced. Pack types:- Sold in a bag (with name sheet) in the early 1960s, and with a headed card until the late 1970s. They were bubble packed from the late 1970s, and all three types of backing card have been seen, including the later 61106 version. Now illustrated are two name sheets. The familiar green-print version is from the early 1960s, whilst the standard heavyweight 'keepers have a new version with logo. C107: Referee and two linesmen. One of the more obvious accessories for any football game, the referee and linemen set was a straight lift from the 1950s celluloid range. Charles Stadden's invoice for his work on the set was dated June 1963, and they first appeared in the 1963-64 catalogue (introduced August 1963). As usual with Subbuteo there were variations to the set, which I'll deal with below. Charles Stadden's original set had a chunky design, which sat in the standard (slotted) heavyweight player bases. It was an old school look, with baggy clothing and long shorts. The referee was well detailed, with his hand holding the whistle, and a clear top pocket. The long life of this figure (and usual Subbuteo eccentricity), has created a multitude of variations. The figures were usually produced in black plastic, so a minimum of painting was required. However, referees on flesh and white plastic also exist in reasonable numbers. The base colours also varied of course. The most common is probably a green outer/white inner, but the reverse also turns up, and looks quite nice. A black inner on green outer is also reasonably common. The most bizarre variation (catalogued in the early 1970s) was the "maroon" version. This was produced in claret plastic, and base inners of the same colour were usually used (although white inners also turn up). There is some sense to having different based referees. If you were a Plymouth fan, your referee would clash bases with your team... although did anyone actually play with these figures on the pitch? Pack type:- A small accessory, so simply sold in a bag with headed card. As usual, the early sets also have a bag with paper insert, with "C107 referee and linesmen" written on in green. The heavyweight accessory figures were looking out-dated by the late 1970s, and the decision was made to update them. 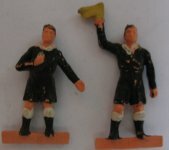 The new referees first appeared in the 1980 catalogue, and were scaled to match the other new "stand around the pitch" figures such as the ball boys, and new police/photographer sets. As such, the new figures were placed on the small accessory bases. This meant the linesmen matched the other figures on the touchline, but the referee was dwarfed by the players. I assume this experiment was not a huge success though, as the officials soon found their way back onto player bases. Pack type:- The small-based referees have been seen in all three bubble pack styles from the period. The Lightweight based version 1985-96. By 1985 the thin officials had been put back onto (pegged) player bases. This was especially pleasing for those of us that liked to field a refs team as a "minnow" in cup competitions alongside the spare goalkeeper team (the linesmen just fall over, but the ref can play a bit). This version lasted through to 1995, and then combined with the flag set (61188) to become the new 61240. They also featured in the Premiership boxed edition and accessory set (61234) wearing dark green shirts. The pegged officials were originally produced in white plastic, but later sets returned to the black plastic of the 1960s. The flags should be one yellow and one red, but are sometimes painted in flesh colour instead by lazy painters. I also own sets where Subbuteo have not bothered to paint the figures at all. Pack type:- They would have been sold in the final "goal net" style of bubble pack, before being sold in one of the small "pitch corner" accessory boxes in the 1990s. A completely new design of referee was produced for the 1998 and 2001 Premiership Editions. ...including advertisements which achieve a realistic appearance. Designed to keep the ball on the table, the fence had two major incarnations under this number. First up was the red fence, with big advertising hoardings supporting a single line of straw-like poles at a height that stops a standard football (but sadly not the small FF size). This red set was introduced in 1963, and was a marked improvement on the "clips and string" of Set Y. The poles were those used in the red floodlights set. The second version was a picket fence design, made of green plastic with brown supports. Usually four of the fence panels had room for advertisements on them (do I even need to tell you this - who hasn't seen one??). The green version was "new for July 1970" in the 1970-71 catalogue, where it featured alongside the red fence (the old fence was dropped the following year). From then on, it was available right through to the final accessory range of 1996-97, and featured in the 2003 editions. Lucky then, that it was a sound design, and worked really well. The later fence was also produced with brown panels for the rugby game, white panels and blue posts for the cricket game, and in the 1990s it appeared in red with white posts for the Manchester United Edition. So it should be possible for an Italian collector to use the green, white and red panels to go around the ground (although cricket fences can be tricky to locate these days). The fence was looking out of date in the 1980's, and for a time it had a rival in the crowd barrier (C170) . However, that didn't prove popular, and left the lists even before the real-life crowd barriers were taken down. Box types:- The red fence was sold in a lift-off lid box, matched to the teams of the time (although obviously bigger). The green fence spent the whole of the 1970s in an early 1970s style of box (middle picture). There were actually several versions of this box, including slide-out trays, lift-off lids, and address changes. Some of the boxes were also designed to store either the rugby or cricket fence. In the 1980s and 1990s, the fence was re-boxed in the various styles of the time. First up was the monochrome logo box (pictured), then the green-logo, red logo, and finally the pitch-corner style (available with both Waddingtons and Hasbro details). C109 Two fully assembled deluxe goals. manufactured in strong white plastic available with BLACK or WHITE P.V.C. plastic netting. For years, this poor item has had to put up with a simple catalogue description and a poor joke about the other uses of PVC.... but finally, we have pictures and details. This goal was a short lived item at the very start of the Continental era (1963-64 to 1965-66 only). As the "N" on the box suggests, this was simply the standard plastic Subbuteo goal, but with a hard plastic net. The net had four small plastic loops which simply hooked onto the front and back posts of the goal. This did leave the goal open at the back struts to possibly let the ball through, although the plastic is quite firm. It actually made for quite an attractive set, but I'm not sure what advantages there were over the standard nets (perhaps just one of cost). Maybe by leaving the old nets in the flat range (as set N), Peter Adolph was hoping the buyers of continental equipment would automatically order these goals when they needed new ones, but the short life suggests that Subbuteo buyers were unconvinced. I've also been advised that these goals have been sighted in Display Editions dated to 1965. 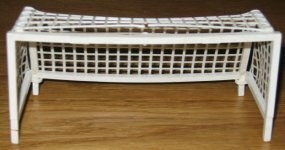 September 2008: A big thank you to Ashley Hemming who supplied the pictures and details on this item, and to Martyn Burr who sent in the picture of the white plastic version. 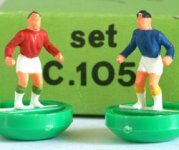 The Subbuteo pitch was previously sold in the earlier A-Z range, but having two ranges was confusing and it made sense to switch it. This finally occurred in 1973, but for a few years it retained its old number as well, so it was C109M. Again, the standard pitch had all sorts of variants in its long life. The early pitches did not have the Subbuteo written on them, and had chunky lines and big penalty spots. In the 1970s they tried a variety of different sized logos. In cost cutting measures, the pitches got thinner in the late 1970s so that the white lines were visible from the reverse side. Then from 1981 the material changed to a thin nylon, with visible threads running across it. These nylon pitches had a tendency to crease, and the edges were likely to start unravelling. In addition the surface could fluff up, to the point where the player's arm got caught during swerves. Not a popular switch, but at least it sold more Astropitches... The later style pitch also had different logos. The one shown is from the early 1980s. Later ones used the lozenge shaped logo. Pack types:- I believe that the pitch was not boxed until the monochrome logo era (1981-83). Before that, the pitches seem to be have been sold in clear bags. The monochrome-logo box had a very dull picture of a pitch on it. The boxes which followed tried to make it more exciting by having "action pictures" instead. The green and red logo boxes had Liverpool vs. Spurs, and the pitch corner box had Liverpool vs. Wimbledon. Whilst some might consider that to be too much Liverpool, the 1990s box was from the 1988 FA Cup final defeat, so is probably painful for Liverpool fans. Other pitches in the range include the Astropitch, (C178), and the Italia '90 pitch (61221). In the late 1990s there were Premiership and Man Utd pitches in the box sets, as well as a Hasbro "cotton" pitch from 1997. This was reminiscent of the classic 1970s pitches (but with the new logos, and not quite as thick material). Complete with TV camera and monitor, cameraman and commentator. 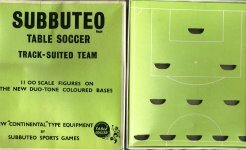 Another popular item of Subbuteo, this was produced very early in the range (1964), and was available right through to the Hasbro era. In design it was a square brown tower which was supplied ready assembled. You received four figures with the tower. On the top was a cameraman in a thick blue coat, complete with camera. On the middle floor was the commentator complete with monitor (to watch the replays). The camera and monitor had spikes that fixed them to the platforms. The monitor had two spikes, whilst the camera had just one, and you could not assemble the tower in any other way. However, the cameraman and commentator were free to slide around and fall over. Charles Stadden invoiced for the people (but not the tower) in June 1964. The first illustration above shows the early 1960s version of this item. On this original TV Tower the vertical supports were simply copper poles wrapped in white plastic (matching the goals and goal-holders of that era). The plastic parts of this early tower were a much lighter shade of brown. The much more common plastic sided version arrived in the late 1960s. The set passed through about five box types and lasted on C110/61110 until 1985 when it merged with the 1980's cameramen to make set 61208. Between 1981 and 1983 it had a rival, the grey TV Tower kit (C186). As with the fence surround, the classic accessory proved the more appealing item. Box types:- The tower originally had a very uninteresting box, dull green in colour with only the 1960s kicking logo, and description. In the early 1970s the box was updated with the new logo (and a brighter colour) but was otherwise unchanged. It was not until the "hobby-crest" era that the box received an illustration (see top). The monochrome-logo box (1981-83) had a even nicer illustration, and I think there is a green-logo version as well, which would have a colour illustration (although 61208 was also produced in that box). This seems a good point to take a break, the page having already grown rather long. If you wish to push on deep into the heart of the 1970's, then you can follow the links laid out below.